The goal of a Demand-Side Management (DSM) system is to efficiently use the available energy without the necessity of installing a new transmission infrastructure. The correct design and use of DSM systems in SGs translates to massive financial savings. For example, in the USA, shifting demand away from critical periods reduces overall energy consumption by $17 USD billion. The majority of the work in DSM has been carried out on static scenarios which are different from real-world situations where the environment is constantly changing. 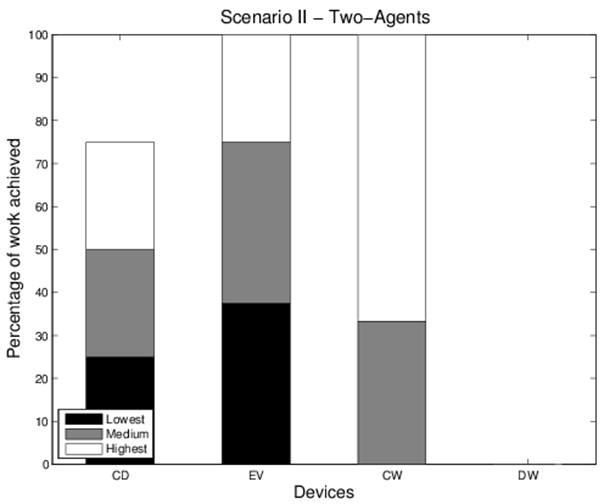 Researchers have also focused their attention on individual interactions between users and the utility company. However, by focusing on the interactions between devices instead, improvements can be found in several areas. For example, saving costs; reduction of load at the transformer and reduction in the peak to average ratio. 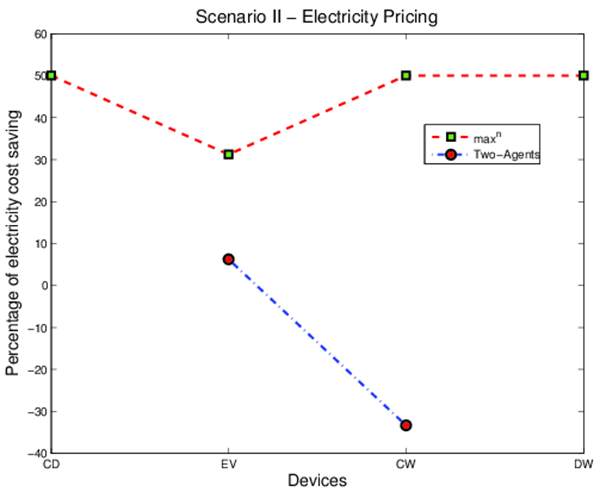 We simulate a dynamic scenario by using different pricing schemes that are used as a signal by the devices to be either switched on or off, depending on the cost at a given time. 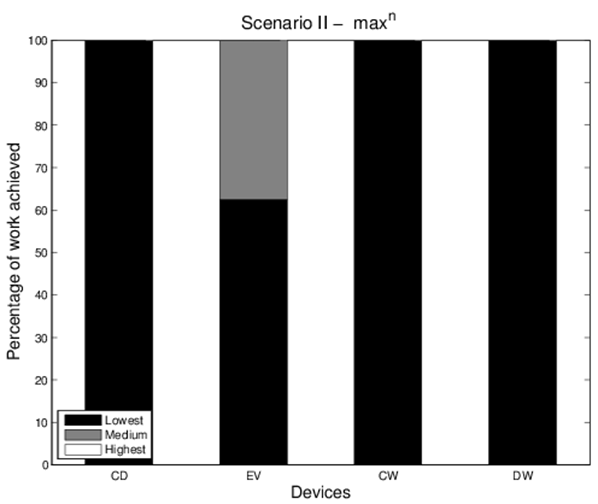 Rather than focusing only on how each user behaves individually, a good DSM program should consider what other entities (e.g., devices) might do. MCTS builds and searches an asymmetric tree to make a decision. The first phase is a tree search which is accomplished by selecting a node to expand using tree policy. Next a random roll-out to end of simulation is performad, when the true value is known, then the tree is backed up. 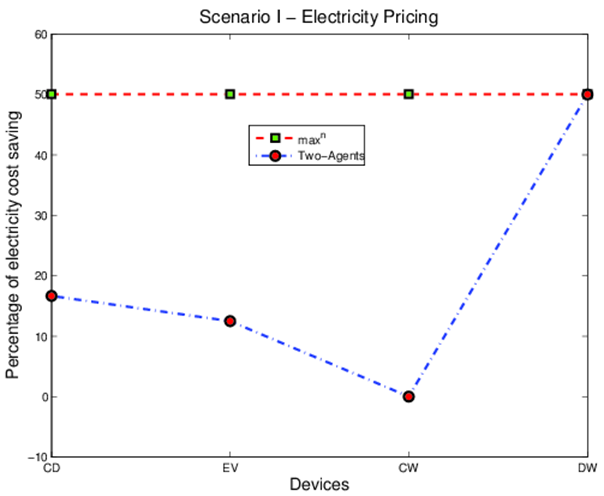 The goal is to learn the optimal times to switch electric devices on or off (e.g., charge an electric vehicle at a specific time) in order to minimise costs, by learning and predicting the electricity price, based on a pricing history. This is evaluated in a four agent system. Through multiple interactions between agents and correct modelling of the problem, it is possible to achieve significant cost reductions. MCTS finds the optimal solution in most cases. The multi-agent MCTS approch demostrated here has been proved effective, it can now be extended to allow aditiobnal agents.